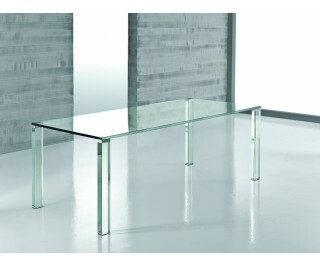 Dining table with tempered extraclear crystal glass top (thickness mm. 19); removable legs (dim. cm. 5 x 8) available in: crystal glass, wood or thick hide covered. Produced in many different dimensions, can be also custom made. Height cm. 74,5. A patented mechanism allows you to disassemble the legs and to reassemble them perfectly aligned to the top. Two trestles are furnished; this allows the customer an easier assemblage with no need to apply to skill labour.